This evening I have the house to myself, since my wife and my son have gone to an information evening at his school. I like to dine simply on these occasions, so I made myself a sandwich of peanut butter (crunchy, of course), Jarlsberg cheese and just a touch of Marmite. Pretty good - all I needed apart from this was a glass of water and I was happy enough. Switched on BBC Radio 3 and caught part of a concert given in Edinburgh by the BBC Scottish Symphony Orchestra. Main item on the programme was to be Vaughan Williams' Sea Symphony, of which I've never been very fond, but we kicked off with Thea Musgrave's Turbulent Landscapes, which I really don't know at all. The theme of Ms Musgrave's suite is a musical interpretation of 6 paintings by the artist JMW Turner, and batting at No.4 was Turner's very quirky War: The Exile and the Rock Limpet, which I hadn't thought about in years. I have always found this picture very haunting, though I never quite knew what to make of it. You may write an essay on it for your homework - 1000 words will be fine. Perhaps you could bring out the implied contrast between imperial glory and the minutiae of Nature - or any other theme you like will be fine. You will have marks deducted if you mention the size of Napoleon's hat, by the way. Reference to the British guard will be OK, however. Mention of marks deducted reminds me of a private joke which my late cousin Dave and I kept going for years. We lived through a period when it seemed that new works of art were judged by the weight of the justificatory text which accompanied them, rather than the work itself. We once attended a concert at the Liverpool Philharmonic at which the first item was a recently-commissioned orchestral piece about the coming of the Industrial Revolution to agricultural Britain (well, England, I guess). The composer himself gave an introductory talk lasting about a quarter of an hour, in which he described his interest in the subject, how (and why) he had been approached to compose the piece, and how he had attempted with contrasting tone colours and symmetrical harmonies to create an image of smoke and fire against a rural idyll. He then conducted the piece himself, and I swear it lasted about 4 minutes. Dave and I were transfixed. We were about 17, and we immediately declared war on critics, radio announcers and all pseuds in general, and we invented a scoring system, which awarded "faults", rather in the style of equestrian show-jumping. The speaker/writer could collect single faults for the use of undergraduate gushiness such as "lambent" or "plangent" (etc), and there were also a few biggies for words or phrases we really disliked. A "clear round" was a rarity - a text or talk which contained no offending words at all. Back to the present, the night of the peanut-butter sandwich. Tonight's announcer on the BBC (who was only reading a prepared script about the Musgrave piece, poor sod) scored 4 faults for "juxtaposition", which is always accompanied by a faint klaxon, but otherwise performed well enough. Dave died and dropped out of the game years ago, but I still keep my hand in with the scoring system when I get the chance. I have a few newbies since Dave's time - "Zeitgeist" gets 8 faults - which is a double-refusal or something - and I have a few others. This all smacks a little of inverted snobbery, which is never attractive, but it really just reflects a long-held prejudice against the posturing bourgeoisie - though it occurs to me that it may reveal me as the biggest pseud of the lot! Because the comments got me interested again, I thought I'd put a link to the relevant Part IV of Thea Musgrave's suite, as discussed. Now here's an interesting idea: after you've heard the music, you could go and paint a picture giving your idea of what it portrays. Then someone could write another new piece of music interpreting your new picture, and so on, for ever. Great, eh? Like the most pretentious game of Chinese Whispers in history. If we produce a variation on the showjumping analogy, the limp little quote from La Marseillaise must be worth 8 faults on its own? And, just in case you missed it (because you were asleep? ), there is a reprise at the end, which is no more inspiring and must be worth a further 8 - no VAR allowed. Boney looks oddly tortured all thin and stretched out like that. St Helena was Hell, of course. I'll leave my 925 remaining words to your next visitor! Thanks you, Jim, for entering (once again) into the spirit of my blog. Much appreciated. Sorry, was there something else? Not really - I think that covers most of it. The issue with the teeth and peanut butter is sad - agreed. My teeth struggled a little with Thea Musgrave, but that is entirely my own problem and loss. I hope it will be in order if I also mention here that I received the inevitable shaft of moonlight from my friend Prof De Vries, who wanted to know more about my list of pet-hate words. I'm not sure if it adds up to a proper list, though I know them when I spot them - it's an instinctive thing. "Tropes" is a current turn-off in commentaries or criticism - the world was happy without tropes until fairly recently, I think. Fashions in art are inevitable and healthy; fashions in criticism are mostly just irritating. I also have problems with critics attempting to apply language from the world of visual art to music - it can come across as, at best, awkward. I do not wish to hear of "tenebrism" in a musical context, to take a recent example. Sometimes, satisfyingly, the critical language backfires and reveals the general lack of education of the critic. I recently read a very po-faced review of a contemporary jazz recording which made it clear that the reviewer thought that "chromaticism" meant something to do with "adding colour", which suggests he needs to attend another night-class fairly soon. Ah, this makes me feel comfortably rustic and naive, something I came by naturally but struggled at times to retain under the influence if not pressure of college and urban social pressure. So just to be safe, I looked up said words (ok ok I don't think I've ever heard any of them before but chromatism seemed pretty clear) and confirmed that they all seem to be made up words meant to portray the user's mental, social and moral superiority by using non-English terms but which tend instead to display the user's poor grasp of plain English. A bit like certain wargamers referring to Ancient British slingers as psiloi. I'm a believer in people saying what they mean - eloquently, if they wish, but there are few things more annoying than critics struggling to squeeze in all the current "smart" words. Music critics usually have no musical training or ability anyway - they just relish the opportunity to sound off to impress people. The reviews (and the sleeve notes) invariably are all about them and how much they know, rather than the matter in hand. Chromaticism (as I was taught it, matron) is the use of chromatic scales rather than (diatonic) scales-as-we-know-them; chromatic scales are simply strings of semitone intervals - all the notes there are - so there is no key or tonality implied by a chromatic passage. Start where you like, get off where you like. That's all there is to it - i.e. it means something in music theory; I think the critic in question was attracted only by the number of syllables. I include this gratuitous explanation only in mild self-defence, and so that you may drop the subject effortlessly into conversation if you have the misfortune to be invited to a local music appreciation society supper. Oh in younger days, mess dinners and official cocktail parties where "subbies" were expected to be good hosts to various dignitaries and official guests, long ago taught me the value of looking impressed and using various tones and variations of mhmm and head nodding spiced with the occasional self deprecating question when in polite society. Being dragooned into a union executive in later years not to mention a very brief with political activism led to more bellicose and enjoyable conversations for a short while. Now I'm free to ignore anyone who doesn't seem interesting to converse with once the social pleasantries are past. Beautifully said, young sir! I had a (fairly distant) relative who went from private boarding school to the army, and he was a subaltern in the Foot Guards - which sounds a bit like an adventure, except that, since he was a very presentable and gracious young man, he was given a staff appointment, and spent his time as ADC to various idiot sons of the aristocracy, making polite conversation at diplomatic functions with representatives of foreign nations from whom he would not have purchased a used automobile. He was thoroughly sickened by the whole experience, though he reckoned it might have been preferable to being shot at in Aden and elsewhere, and he left the service at the first opportunity, getting a transfer to a job with the Crown Estate Commission (which was sort of Civil Service, but was at least civilian). Another of my deceased relatives (I seem to have a great many of these, going back centuries....). I met him a couple of times only, and I would have thought he would take to the dignitary protocol in the army like a duck to water, but apparently he just hated it. He also got a lot of grief from his colleagues who were doing proper soldiering, but that is quite another story. He had all the graces. Me, I never had any. Personally, I always wondered if Turner had really bad eyesight - but I'm a Philistine. Are you going to publish details of your points system? Sounds like fun. My missus is doing an English and History degree as a mature student and I'm finding her reading matter a revelation. I never knew there were so many different types of literary criticism each with its own stock of obscure and meaningless terms. I think he maybe took acid or something. No-one can expect me to believe that his hairier efforts (eg - Longships Lighthouse; Sundown over a Lake) were painted by the same guy that did the view of Dieppe Harbour, or Fort Perch at New Brighton. If they were, then he was out of his brain. I have to watch this, because saying anything disrespectful about Turner is potentially very uncool indeed. Show-jumping system. I fear that my lists are out of date, and heavily oriented towards music criticism, so they would not fit well with the English and history bit, but I am confident you and your wife could come up with your own score-list, which would be more relevant and good fun too. I do remember a couple of style pointers - extra faults are available for odd grammatical construction, or deliberately contorted participular forms. One example that sticks in my mind was that describing a musical sound as "bright" was regarded as OK, while "luminous" scored a single fault, and the rather more rare "possessing luminosity" is a straight 8 points and a sending-off, first offence. Show the bastards no mercy, Dave would say. I've never really forgiven him for that Temeraire business, which always seemed like bad taste to me, like Stubbs painting a famous racehorse on the way to the glue factory. It would be good if a very famous literary critic and scholar were to deliver their best shot, and at the end the front row of the audience stood and held up cards - like the judges at the figure skating. I'm off to Tescos...no, seriously. Good man - easy on the Marmite. Radio 3's Sunday morning lady has been trailed heavily this week, and may have scored highly - talk of getting many 'colours', just like in one's diet.. speaking of which, I will try that sandwich recipe, thank you! It would be a shame to pick on the BBC lady, but I think you should anyway. Let me know how you get on with the sandwich. as for the painting, the feeling invoked in me is loneliness. The framing, with contrast space in the upper left and right hand corners, had me thinking of the space created by medieval artists for cherubs/angels/designs...but here of course, no cherubs, no angels. The music? As a stand alone piece, bleak but hard to get in to. The full suite of Landscapes... bleak, but easier to follow. Thank you Ivan - about time someone attempted to add a little class to the proceedings here. Bravo. Interesting you mention the space in the picture. 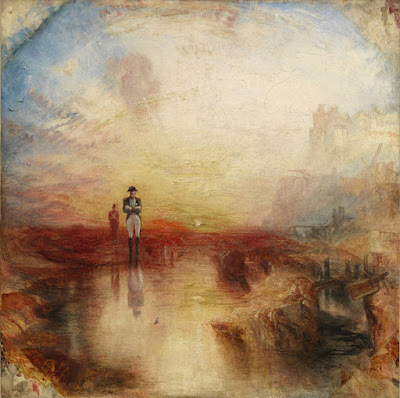 This is a terrible irreverence, and I don't know much about Turner's work anyway, but sometimes I wonder how he knew when a painting was finished - did he start out with just a rough idea, to see how it went? Do any of us know when a project is finished? Interesting questions for wargamers, maybe? we all start out with a rough idea and a lot of enthusiasm. Nice blog. Only found it recently, so still catching up. Thanks. Well said, young sir. In a forgotten age I used to manage real software projects in the [spits] finance industry - it didn't go too badly, surprisingly, considering the hash I can make now of fixing a date when a specific miniatures unit will be ready for action. I think I might have been more worried about other people's deadlines than I am about my own. Thanks for visiting the blog - watch out for the rants - they're mostly very silly.